Nick Paumgarten of The New Yorker gives us a close look into the early days of Ethereum and the minds behind the No. 2 cryptoasset. In the same vein, Decrypt Media gives us an interesting look into the creation of Augur (REP), the thought-provoking prediction market built on the Ethereum protocol. Traders and retail investors like you and me can now use the user-friendly Coinbase app to send and receive USDC, while remaining confident the value is stable. USDC follows the ERC20 standard, which means it can be used with anyone using Ethereum’s public blockchain. This is great news for the burgeoning ecosystem of crypto programs, dApps, exchanges, and blockchain-based games who want to interact without taking on balance sheet risk. Between PAX and Gemini, Ethereum already has nearly $100M in USD-backed tokens on their network (with USDC now joining them). Despite what people say about the ETH token use case, the Ethereum network continues to dominate the public blockchain space. A stablecoin that has the legitimate backing of Coinbase and Circle is immediately more reputable than Tether which has had non-stop controversy over the past year. The Securities and Exchange Commission played no small part in opening the floodgates on a new investment by telling investors to be “open” to this new technology. Since then, investors have been flocking to it. And now, these investments have created a unique type of income stream. These aren’t CDs, bonds, real estate, dividend stocks… or anything boring like that. You can get started with a small stake… And see as much as $44,740. Bitcoin Network Momentum was recently introduced by PositiveCrypto… and it’s a new and potential groundbreaking indicator for bitcoin’s foreseeable price. You can learn more about the BNM indicator here. Or check out the interactive view on Willy Woo’s website here. It’s been an interesting week for crypto reports, but to make it easy for you we compiled the top three from the past week and provided some interesting findings, respectively. 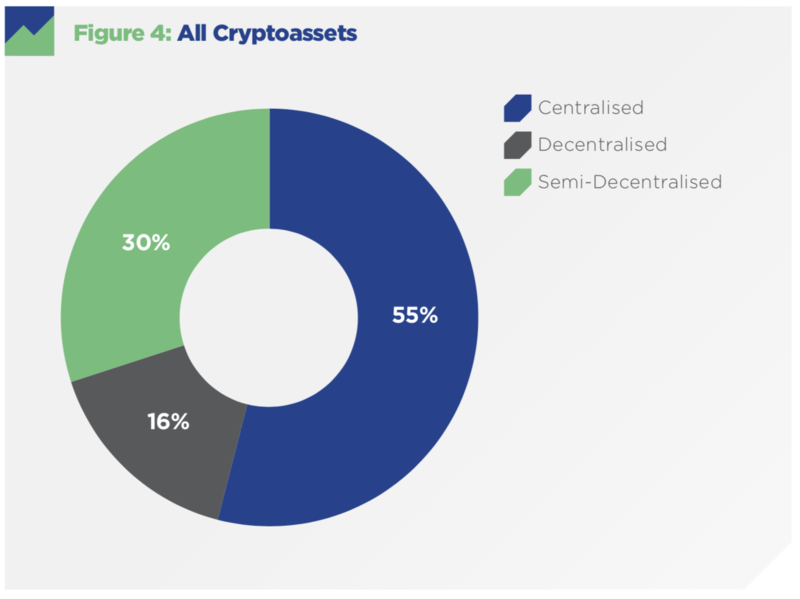 A lengthy update on token distribution, fundraising trends, and FV’s new investment thesis. 71% of ICOs financed last year reportedly still have no working product or offering in the market. Yikes. How Can Bitcoin Stabilize If It’s a Keynesian Beauty Contest? Intimidating phrases, but don’t let them dissuade you from reading Tony Sheng’s most recent article where he explores a few plausible paths to Bitcoin’s stability. Whether that stability happens at a high price, zero, or somewhere in between remains to be seen. Want to dig deeper? Tony’s article from September, ‘The Narrative Bubble Loop‘ is a great pairing. Here’s a post that was sure to ruffle up some feathers. Ferdous Bhai takes a look at the growing “cult” of Bitcoin maximalism and the dangers that the ideology may present. Agree with him or not, he makes some interesting points in this controversial essay. Two of the main narratives around Bitcoin are the Digital Gold and Store of Value (SOV) use cases. These two narratives often go together, but let’s take a step back and explore them separately – in layman terms – as we often hear too much clamor about each. On Thursday, the SEC announced plans to open a new division with the mission of educating financial technology startups (including ICOs) on the regulations relevant to their business. Meet FinHub. This Strategic Hub for Innovation and Financial Technology will be the go-to spot for information on regulations that relate to financial technology and ICOs. Companies will be able to talk face-to-face with regulators at FinHub to ensure that they are compliant with regulations. Instead of a chart, this week we’re doing something a little different. 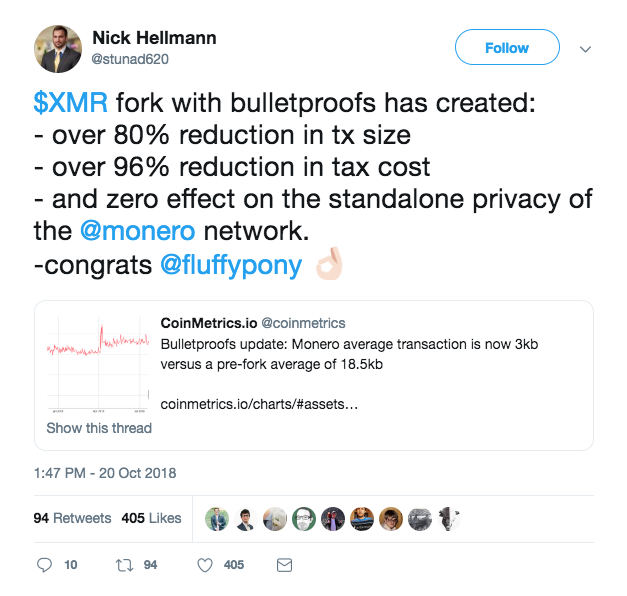 Our first Tweet of the Week comes from Nick Hellmann highlighting what Monero (XMR) recently accomplished. For more details on the significance of Bulletproof, click here. Many crypto hedge funds are going to shut down in the next 12 months – but not for why you think. 📌 Crypto ‘Fake News’, Bitcoins After Death, and Where Did The Money Go?